Heat 4-quart or larger saucepan two-thirds full of water to boiling over medium-high heat. Prepare an ice bath (ice and water mixture in large bowl). Meanwhile, remove florets from cauliflower, and cut into 1-inch pieces (about 5 cups of florets). Add cauliflower to boiling water; boil 4 to 6 minutes or until tender when pierced with paring knife. Drain, then transfer to ice bath 2 minutes. Drain; pat dry with paper towel. Place in single layer on cooling rack or paper towel to dry. In large bowl, mix vinegar, mustard and salt. Beat in mayonnaise with whisk. Add red onion and celery; stir. Add cauliflower; stir to coat. Refrigerate 30 minutes; top with crumbled bacon just before serving. Mix it up and make it your own by using the same technique with different potato salad ingredients. Go mayo-free, like German potato salad, or even mash the cauliflower for a delightfully "creamy" version. This salad gains flavor as it sits. 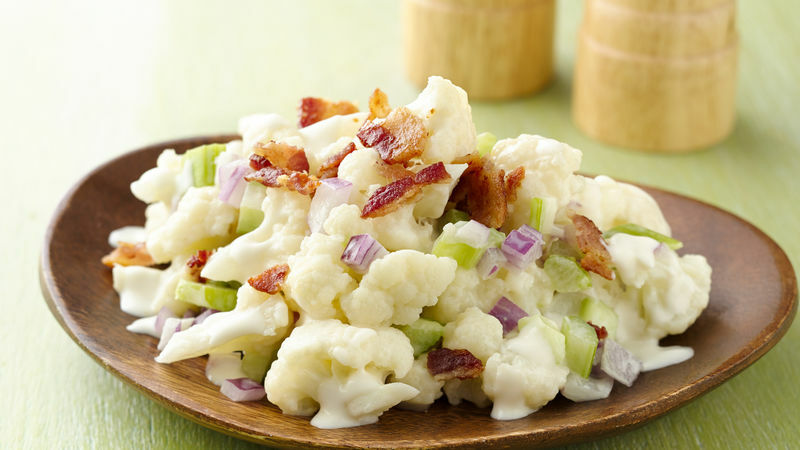 Allowing the cauliflower to marinate in the dressing allows the flavors to meld and improve, making this a great do-ahead dish. If you crave the flavors of traditional potato salad, try this modern version with nutrient-dense, lower-carb cauliflower as a stand-in for the potatoes.